Dr. Eric Griener received his Bachelor of Science degree from Southeastern Louisiana University. Following this, he completed his medical degree at the LSU School of Medicine and then internship and residency at Tulane University. He was a fellow in pediatric ophthalmology and strabismus at Emory University in Atlanta, GA. Dr. Griener specializes in cataract and pediatric strabismus surgeries. 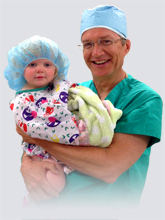 Formerly a pediatrician, Dr. Griener also specializes in general pediatric ophthalmology. Dr. Griener is a board certified ophthalmologist and a member of the American Academy of Ophthalmology.